^ 2.0 2.1 2.2 2.3 Liberia. World Economic Outlook Database. International Monetary Fund (IMF). April 2016 [2016-06-24]. ^ Liberia Institute of Statistics and Geo-Information Services. 2008 National Population and Housing Census Final Results: Population by County (PDF). 2008 Population and Housing Census. Republic of Liberia. May 2009 [2009-06-10]. ^ Liberia's Ugly Past: Re-writing Liberian History. Theperspective.org. [2010-01-03]. ^ Moore, Jina. Liberia: Ma Ellen talk plenty plenty Liberian English. Pulitzer Center on Crisis Reporting. 2009-10-19 [2011-07-22]. ^ Languages of Liberia. Ethnologue. 2009 [2011-07-22]. （原始内容存档于2011-10-18）. ^ Freedom in the World 2011 – Liberia. Freedom House. UNHCR. 2011-07-07 [2011-07-22]. 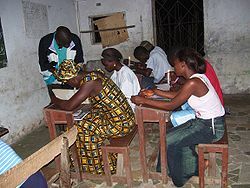 ^ Education profile - Liberia. Institute for Statistics. UNESCO. 2010 [2011-07-20]. ^ LIBERIA: Go to school or go to jail. IRN. UN Office for the Coordination of Humanitarian Affairs. 2007-09-21 [2009-04-08]. ^ Trawally, Sidiki; Reeves, Derek. Making Quality Education Affordable And Assessable To All – Prez. Sirleaf’s Vision With Passion. Lift Liberia. 2009 [2011-07-20]. （原始内容存档于2013-05-12）. ^ Jallah, David A. B. “Notes, Presented by Professor and Dean of the Louis Arthur Grimes School of Law, University of Liberia, David A. B. Jallah to the International Association of Law Schools Conference Learning From Each Other: Enriching the Law School Curriculum in an Interrelated World Held at Soochow University Kenneth Wang School of Law, Suzhou, China, October 17-19, 2007.” International Association of Law Schools. Retrieved on September 1, 2008. ^ Ellen Describes Tubman University's Opening As PRS Success. The New Dawn. 2010-03-03 [2010-07-22]. ^ Remarks by H.E. President Ellen Johnson Sirleaf At Official Launch and Fundraising Program Of the Grand Bassa Community College (PDF). The Executive Mansion. 2010-10-21 [2011-07-22]. ^ Fahn, Peter A. Government Moves Ahead With Education Decentralization Plans. Government Moves Ahead with Education Decentralization Plans. 2011-07-07 [2011-08-03]. ^ July 26 Celebrations Kick Off in Lofa As President Sirleaf Arrives. The Executive Mansion. 2011-07-25 [2013-08-29]. （原始内容存档于2011-10-04）.